Window lit directly by setting sun. 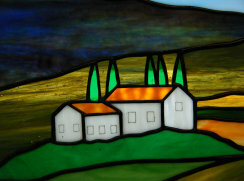 Stained Glass and Painting on canvas are two completely different art forms. 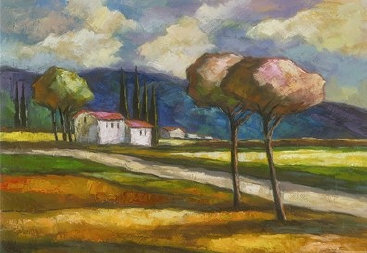 With painting, the artist can create subtleties of light and shading as well as transitioning between objects. 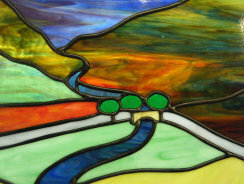 With stained glass, colors and textures are made into the glass, so the artist needs to pick glass carefully to try to achieve the desired effect. 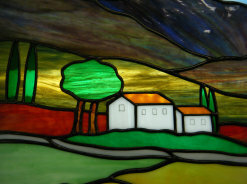 One of the unique properties of stained glass is that colors of the glass appear to be quite different depending on the type and intensity of light on the glass. Note the color difference above with simply a change in light source. Dave and Deb allowed me to have initial choice of colors and before final assembly we made a few color changes to get the final result. 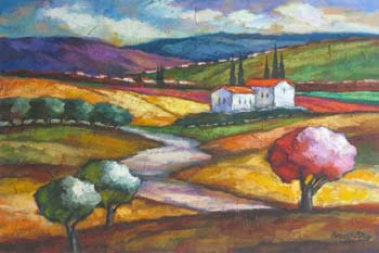 a noted Israeli artist who paints beautiful landscapes with the feel of Tuscany. Dave and Deb sent me a photo of one of Brodinsky's works, and after researching the artist, I suggested we design a stained glass window trying to capture the spirit of several of Bodinsky's paintings. We chose the two paintings below to try to adapt some of his concepts into glass. This was a very challenging project, not so much for its size, but for the careful matching of glass colors and textures required. 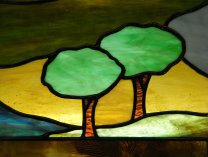 This style of window is reminiscient of some of the landscape windows done by the Tiffany Studios in the 1890 to 1925 period. 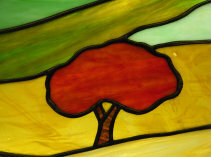 Dave & Deb graciously sent a photo of their window after it was installed in their home.